1.Portable, light and handy.You can enjoy your leathercraft making and much more funny. Then click the orrange button. 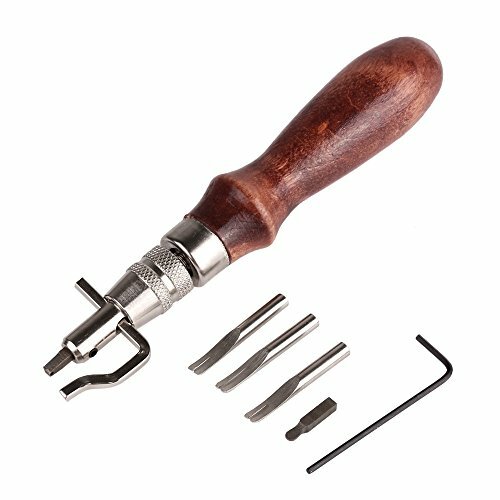 2.Good for the basic stamping set,Kit for beginner, great for personalizing your leather projects. Work as a stitching groover, edge creaser, bevel leather edges, rough edges trimmer and stitching-hole spacer. Better control and downward blade pressure, this blade is on the same line as the handle. Professional tools for leather craft,such as belt, wallet, handbag, leather pockect punch, table mat etc. If you have any questions about this product by Kglobal, contact us by completing and submitting the form below. If you are looking for a specif part number, please include it with your message.